When we first purchased Blue Texel sheep, our goal was to own a flock of forty ewes. Now we have achieved this, we have no intention of increasing the flock any further but we are now working towards improving the quality of the flock year after year by being more selective when purchasing ewes and rams and also when selecting ewe lambs for the flock. 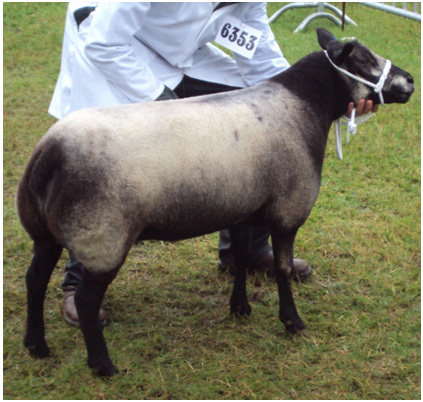 We have a very specific idea of what we like within the breed; this is our own personal taste and obviously not everyone will have the same opinions, but that is what makes breeding sheep so interesting and challenging! As there is still only a relatively small number of flocks in the UK, one of the biggest challenges facing Blue Texel breeders at the moment is to find a bloodline within the breed that has no relation to their own flock. For this reason, we decided to travel to the Netherlands in 2011 in search of new bloodlines. We had a thoroughly enjoyable trip; the Netherlands is a beautiful place. We travelled the length and breadth of the country and were fortunate enough to visit several flocks along the way. We made a lot of new friends on our journey and received a warm welcome from everyone we visited.